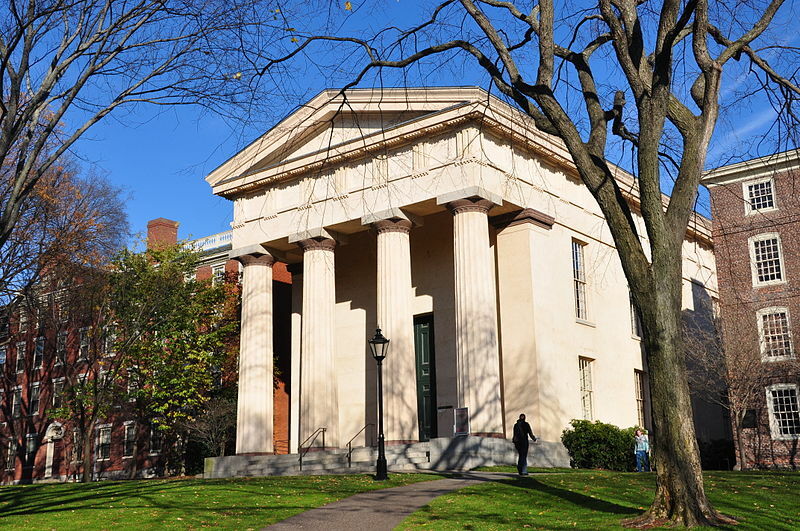 Founded in 1764, Brown University is the seventh oldest post-secondary institution in the U.S. As a leading research university, Brown maintains a commitment to an undergraduate liberal arts education. A healthy mixture of (often liberal) political activists, free spirited, open-minded, outgoing, fun-loving, self-motivated, and ambitious students make up the 6,000 undergraduates at this Ivy League institution. While students work hard, there is a general laid-back attitude, and Brown students fit into every imaginable social niche. With its location in the historic New England city of Providence, it’s no wonder that that this town is dubbed the creative capital. Most high school seniors choose to send in applications to Brown University Admissions because of its robust academic resources and, of course, its liberal ambiance. Brown University is located in stunning Providence, Rhode Island (photo credit: chensiyuan). While it’s likely that most students at Brown do not take all of their classes pass / fail, the option is certainly an enticing one for those who want to experience a challenging course without having to pay the penalty of a mediocre grade. Yet students who dare to go this route for too many of their classes would undoubtedly have a tough time gaining acceptance into graduate schools. Another one of Brown’s greatest appeals is that there is no core curriculum. Students can design their own concentrations, and there are approximately 70 concentrations from which to choose. While the freedom of being the architect of one’s own education can be daunting to some, it can also be a most exciting experience. However, it would be a huge mistake to think that students view Brown’s open curriculum as a means of avoiding core courses because that’s not why the open curriculum was designed. Quite the opposite. With the open curriculum, students are able to explore their academic passions without the restrictions of prescribed general education classes. The open curriculum was in fact designed so that students could find new challenges and passions even though this adventure could lead them to tread outside of their comfort zones. Adjacent to Brown on College Hill is the Rhode Island School of Design (RISD), and any Brown student can take up to four courses at RISD through cross-registration. For more serious art and design students, the Brown/RISD Dual Degree Program is a five-year commitment that allows students to pursue multidisciplinary work. Students may combine disciplines such as math (at Brown) and architecture (at RISD). Upon completion of the program, students earn a Bachelor of Arts (A.B.) from Brown and a Bachelor of Fine Arts (B.F.A.) from RISD. To be admitted to the program, prospective students apply and are accepted to both Brown and RISD and then go through a second admissions process by the Brown / RISD admissions committee. Each year, approximately 15 students are enrolled for the dual degree program. Through a housing lottery, students live and learn in their community. Alternatives to housing are the Program Houses which encompass Greek organizations and Theme Houses. Program Houses host events for their members and for the entire Brown community. For the Class of 2019, Brown University Admissions accepted 2,580 students in a total applicant pool of 30,397 freshmen, with an overall acceptance rate of 8.6%.